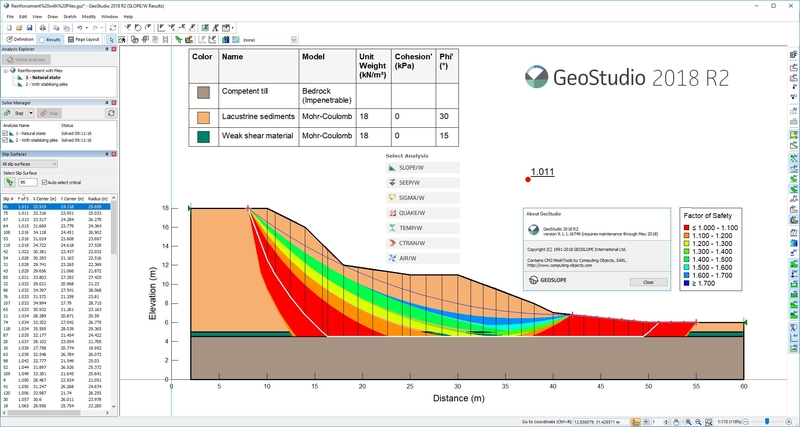 GEO-SLOPE International Ltd. is pleased to announce the availability of GeoStudio 2018 R2 is an integrated software suite for modeling slope stability, ground deformation, and heat and mass transfer in soil and rock. GeoStudio 2018 R2 builds on GeoStudio 2018, extending features added to previous releases. version 9.1.1 - August 17, 2018 - This update fixes a few specific issues. - Combine full and basic analyses in one file: Unlock the power of integration by combining analyses created with a basic license and a full license in the same file. For example, combining a full SLOPE/W analysis with a basic SEEP/W analysis allows the stability analysis to use pore-water pressure conditions computed from a steady-state finite element seepage analysis. - User-defined reinforcements: Model a wide range of reinforcements by defining them as a function of force vs. distance. - Analysis tree: Clone or delete an entire branch of analyses. - Dimensions: Sketch aligned, linear, and angular dimensions. - SLOPE/W graphs: Additional graphs for probabilistic analyses and for optimized slip surfaces. - Tables: Easily add material and boundary condition tables to your drawing. - Sketching: Streamlined workflow when working with sketch objects. - Performance: Improved performance and memory consumption when working with large projects. - AutoCAD 2018 files: Import files created in AutoCAD 2018 or 2019. Feature: A GeoStudio project can now contain analyses with full licenses as well as other analyses using basic licenses. For example, a full-featured SLOPE/W analysis can obtain pore-water pressures from a basic SEEP/W analysis in a single project. Feature: The new "Clone Branch" command will clone an analysis and all analyses beneath it. Feature: The new "Delete Branch" command will delete an analysis and all analyses beneath it. Feature: Sketch aligned dimensions (parallel to the object being dimensioned), linear dimensions (showing the horizontal or vertical dimensions of a slope), or angular dimensions. Feature: Dimensions connected to points will resize as points are moved. Feature: Orthogonal snapping: Holding the Shift key while drawing restricts cursor movement to the X or Y axes. Without the Shift key, lines that are nearly horizontal or vertical will snap to horizontal or vertical. Feature: The new Sketch Materials Table and Sketch Boundary Conditions Table commands quickly add a table of materials or boundary conditions to the drawing. Feature: Sketch commands allow changing properties or typing exact coordinates while sketching. Feature: Sketch Arc now allows editing of the arc's center coordinates, radius, start angle and end angle. Feature: Move text while sketching it (no need to use Modify Objects). Feature: Sketch Text and Modify Sketch Text have been combined. To edit existing text, use the Sketch Text command and click an existing text block. Feature: The Modify Sketch Objects command has been removed. Sketch objects can be edited in their respective Sketch commands. To edit the properties of a line, for example, use the Sketch Lines command and click an existing line. Feature: Improved memory consumption when contour results. Feature: Improved memory consumption viewing results. Feature: Improved performance of displaying vectors. Feature: Import files created in AutoCAD 2018 or 2019. Feature: Font sizes can be set independently for dimensions, axis numbers, and axis labels. Feature: Errors during the calculation of a spatial function will now be displayed in the Define Spatial Function dialog. Feature: A notification is now displayed on the start page if a license's maintenance will be expiring soon. Feature: Add-Ins can use functions defined in the project file. Change: It is no longer possible to change "units of computation" under the Project Properties. Instead, pick a template that uses the correct units when creating a new file. You can also use the View Units command to change which units are displayed. Change: In Define Functions, when changing the function type (such as from spline to step), properties in common between the two function types (such as the Cycle checkbox) will be carried over to the new function. Change: The Sketch Arrows and Sketch Double Arrows commands have been merged into the Sketch Lines command. Change: Moved the Define - Replace in Analyses command in the menu to group it with Define - Analyses. Change: Improvements were made to translations. Bug fix: A function imported from a .gsz file that uses different units of computation than the destination file ends up with incorrect values because units do not get converted. Bug fix: GeoStudio would not accept x-y coordinates pasted into Define Points. Bug fix: Licenses cannot be activated if the username includes certain non-Latin characters. This error is displayed: "No response from the server. Check that you have a network connection. (Error 514009)"
Bug fix: Some error messages in Define Functions display incorrect values because they are being displayed using the wrong units. Bug fix: Using Match Scale on a Sketch Image using the mouse or typing in a value with units results in an error or invalid values. Bug fix: GeoStudio may crash when changing to an analysis using the Analysis Toolbar when no license is available. Bug fix: GeoStudio crashes when interacting with the menus or toolbars while some system dialogs (such as Open File) are displayed. Bug fix: Files with many chained analyses may crash in Results View. Bug fix: GeoStudio will crash if the Reference Scale or Vertical Exaggeration values are deleted. Bug fix: Incorrect keyboard shortcuts in the File menu for the Most Recently Used files list. Bug fix: When opening a file created by GeoStudio 2016 or earlier, flow paths are removed, and an upgrade message indicates "There is no equivalent [feature] in the later version", which is incorrect. Bug fix: After selecting File Print, docked windows appear blank. Bug fix: Some functions do not get downgraded correctly when exporting as a GeoStudio 2016 file. Bug fix: Windows no longer resize properly after a Redo action changes the current analysis. Feature: The new user-defined reinforcement type provides a flexible option for modeling a wide range of structures with spatially variable shear resistance. A function is used to define the relationship between the force (capacity) and distance from the slope face to the intersection with the slip surface. Feature: Draw Graph can now plot Factor of Safety vs. optimization iteration number for optimized slip surfaces. Feature: Draw Graph can now plot minimum, mean, and ordinary Factor of Safety vs. probabilistic run number, as well as Factor of Safety standard deviation and probability of failure vs. probabilistic run number. Feature: Additional slip surface slice information was added to the report, including suction strength and the name of the material at the base of the slice. Bug fix: In Draw Slip Surface Grid, when creating a single line, the wrong edit boxes are disabled. Bug fix: For staged analyses, the shear resistance graph data for non-critical slip surface was incorrect. The persisted FOS was not being used by the on-demand calculator. This bug did not affect the computed FOS. Bug fix: The tension crack option in SLOPE/W could inadvertently remain active if the analysis type was changed to SIGMA/W or QUAKE/W Stress. Change: The minimum suction used in the hydraulic property estimation routines was set equal to a specific minimum to ensure consistent model estimates. The “Fredlund-Xing” method was rightfully renamed “Fredlund-Xing-Huang”. Change: The general term “Beta” was renamed to “Compressibility” so that its meaning is more clear. Bug fix: For tension cracks, the "Filled with water" and "Unit weight of water" properties cannot be edited. This bug is a regression introduced in version 9.0.4. Bug fix: Peclet numbers for 1D transport analyses are incorrect if the domain is not horizontal. Bug fix: Transient SEEP/W/ TEMP/W, AIR/W and CTRAN/W analyses coupled with physics using results from another analysis can compute incorrect results. Bug fix: Water flux vectors are not displayed in Coupled Stress/PWP analyses. This update fixes a few specific issues. We recommend upgrading for everyone whose maintenance covers this release. Feature: An optional .NET attribute (Gsi.Label) can be declared before an Add-In's class or public variables to give them more readable names when displayed in GeoStudio. Change: Improvements were made to German, French, Portuguese, Spanish, and Chinese translations. Change: GeoStudio now defaults to using the best available license on a new installation. Bug fix: Under some conditions, checking out a license (such as when opening or creating a file) can take a long time. Bug fix: The y-intercept of certain functions is shown incorrectly for Reports and View Object Information. Bug fix: GeoStudio crashes in Sketch Text when deleting the text and clicking Apply. Bug fix: GeoStudio crashes when importing regions from another .gsz file created using GeoStudio 2018 R2. Bug fix: GeoStudio may crash when opening some projects created by GeoStudio 2016 or earlier. This bug was a regression introduced in GeoStudio 2018 R2. Bug fix: GeoStudio may crash after clearing the "Parent" of an analysis. Bug fix: Isolines may not update when using the toolbar to change the current time. Bug fix: Some customized units do not work properly in some edit controls, including in Define Spatial Functions, Define Hydraulic Functions Estimation, Define Water Table, and others. Bug fix: In the Time tab in Define Analyses, some dates displayed in the Elapsed column are incorrect. Results are not affected. Bug fix: Interslice graphs using Specified Function parameters may not have computed in certain slip surfaces. Bug fix: Results view does not correctly display contours or PWP ponding. Bug fix: Some point loads on vertical portions of the ground surface may be ignored by the solver. Bug fix: GeoStudio crashes while changing the "Tolerance difference in F of S". Bug fix: Friction angle may be missing in an analysis that was cloned from another analysis and then modified. Bug fix: The solver crashes if an LCI boundary condition is used in a steady-state analysis. Bug fix: Water Mass Balance components may be wrong when Land Climate Interaction boundary conditions are applied to a mesh with triangular elements. Bug fix: The Load Deformation analysis type is not accessible with a Basic license. Bug fix: Depending on locale settings, sometimes earthquake records cannot be pasted into Define Horizontal/Vertical Earthquake Records, producing an error like "The pasted Quake record is missing the X or Y field", or "Unexpected value '0.01'. Expecting a floating point number." Bug fix: The Equivalent Linear Dynamic analysis type is not accessible with a Basic license. 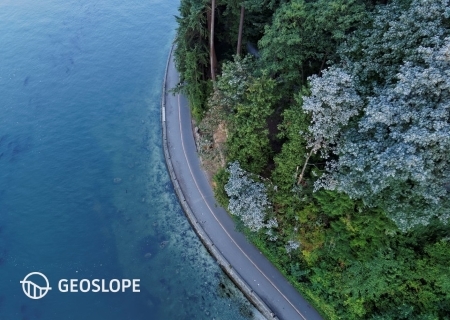 About GEO-SLOPE International Ltd. GEOSLOPE International Ltd. develops, markets and supports state-of-the-art software for geotechnical and geo-environmental modeling. Our objective at GEOSLOPE is to create software that is both technically comprehensive and easy to use, making geotechnical modeling accessible and practical for all geotechnical engineers. Our customers range from small engineering firms to large multi-national corporations and include government agencies, regulatory commissions, leading universities and educational institutions throughout the world. Since 1977, our dedication to software development includes a firm commitment to continually upgrade and enhance the software. We constantly seek to improve its engineering capabilities and remain current with the rapid changes in the computer industry. This makes acquiring GEOSLOPE software a profitable, long-term investment.